As we complete the cycle of the Celtic year, we visit the Lughnasa Garden (pronounced loo-na-sa). It was my favorite garden because it designates my favorite time of year...autumn. It's celebrated on August 1st with feasting and dancing; it signals the beginning of the harvest. 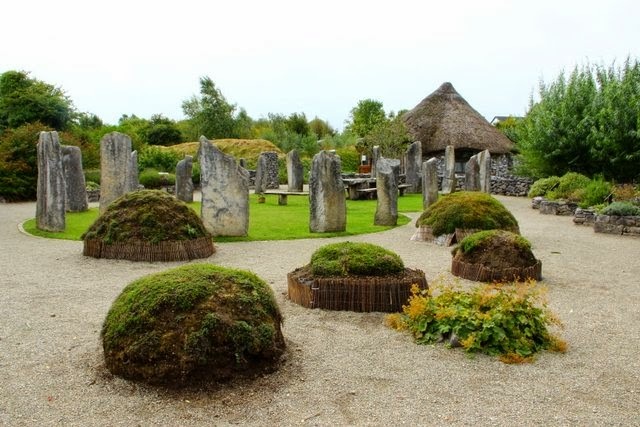 At Brigit's Garden, the area is surrounded by standing stones. Inside are two intersecting circles... one for dancing and one holding a long stone table for feasting. The mounds outside the circle represent the stars of Orion, one of my favorite constellations and one associated with the Celtic god, Lugh. The ancient festival has been Christianized with today's pilgrims climbing holy mountains like Croagh Patrick to honor the saint and the season. In a previous post, I shared the movie, "The Quiet Man" with you. When I bought that video in Galway, the store had a special on...two DVD's for 10 euros. So I purchased "Dancing at Lughnasa" along with it. This 1998 Irish film based on the Broadway play of the same name features an ensemble cast that includes Meryl Streep. Set in County Donegal in 1936, it's the story of the five Mundy sisters and their brother, Jack, a priest who has been relieved of his missionary duties and sent home from Africa. Life is hard in these pre-war years and the sisters struggle that summer trying to keep the family together. It's a bitter-sweet story. Watch it for the gorgeous Irish countryside and a glimpse of the quasi-Christian Lughnasa festival.